CAD-CAM software is an affective CNC programming utility that offers efficient 2.5D CNC machining technology to automate the process. 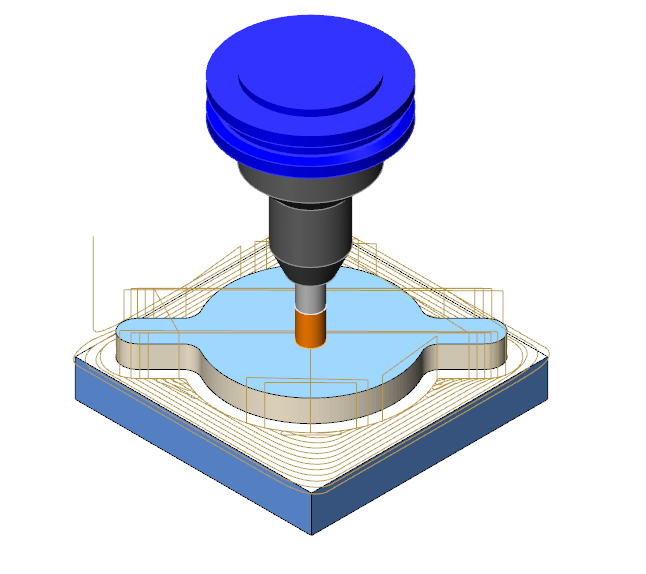 Pocket Milling is one of the most popular types of machining strategies used by CAD-CAM programmers for CNC Milling. With the latest advances in CAD-CAM programming technology we now have “Adaptive Pocketing” which adds intelligence to 2.5D CNC Machining. Pocketing toolpaths are used to remove material within a boundary. You can use wireframe geometry or surface edges to define where the cutting tool will be contained and material will be removed. 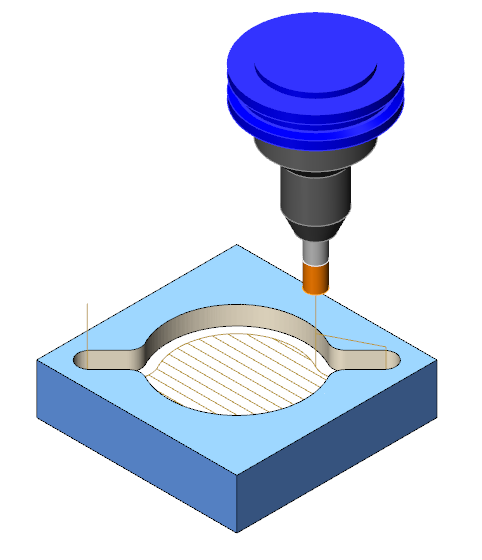 Pocketing is also known as area clearance, lace cutting, raster, open pocket, rest milling, remachining and more. 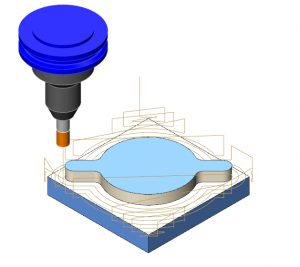 When it comes to the latest BobCAD_CAM CNC programming CAD-CAM software, you have 5 different pocketing styles to choose from. Each pocketing style is suited for specific machining conditions. This pocketing pattern is a classic time pocketing pattern. It’s motion is a back and forth along equally spaced straight lines. This tool path is common when working with software materials like plastics, soft metals and woods. You have the option to machine the profiles of the walls first to reduce or eliminate chipping, or you can have the tool profile the walls after the bulk of the material is removed. Unlike the zig zag pocket, the tool motion is an offset style versus a back and forth style cutting motion. You have the option to offset in working from the outside walls into the center of the part or you have the option for offset out which is working from the inside of the part outward. This pocketing pattern is an offset style and provides you with the control to define model geometry edges that the tool can start off of. Also known as a open pocket, this power toolpath allows you to define where the tool can start “off” the part and work it’s way in. Also known as re-machining, or REST milling, this pocketing pattern is used to get into tight corners where larger tools cannot fit. As a general rule, when removing material you try to use the largest cutting tool possible for the geometry. This machining axiom has been in place for years and when dealing with parts that have smaller channels or radii in corners, you will have left over material. This is where REST roughing comes in allowing you to target this material and remove it with a smaller tool. The CAD-CAM software automtically knows where the left-over material would be and automates the process for you. This new age pocketing pattern is becoming more main stream every day with increased material removal rates by as much at 70%. It’s all in the tool motion which is commonly called trocoidal, where the tool motion has smooth transitions allowing for higher feed rates, deeper cuts, more consistent cutting which save on tool life and decrease cycle times. This style is also known as High Speed Machining or HSM toolpath as the cutting feeds and speeds are much greater typically than traditional offset pocketing toolpaths. The latest BobCAD-CAM software offers all of the pocket milling toolpath strategies mentioned in this article for 2.5D CNC Milling. Download a free CAD-CAM software demo HERE and see how easy it is to create different CNC Machine Pocket milling toolpaths.